The affectionate English Cocker Spaniel is a merry companion with an inquisitive nature. The energetic breed is at home in the field but also enjoys spending time curled up in a big armchair—as long as there are people nearby. They can be demanding of attention, but their lively, playful way is enough to win over anyone in the room. Biddable, yet sensitive, the English Cocker Spaniel learns quickly when gentle, positive training methods are practiced Favored as a sporting dog and made popular by celebrities, including George Clooney and Oprah Winfrey, the English Cocker Spaniel endures as a lovable companion. The English Cocker Spaniel is also known as Cocker Spaniel, Cocker, and ECS. Coat - The English Cocker Spaniel has a beautiful, silky, medium-length coat that may be flat or wavy. A variety of colors are permitted, including solid black, liver, or red as well as parti-colored or ticked. Though Spaniels were a diverse bunch, Cockers and Springers were lumped into one category—land spaniels. Litters produced puppies of varying sizes and qualities, so duties such as springing or woodcock hunting were assigned based on the physical features presented by each puppy. Near the end of the 19th century, breeders began designating types of Spaniel. Due to confusion in the ring and lack of standard practices, the Spaniel Club was formed in 1885. This club created the breed standards for the Cocker Spaniel, among other types. While they were originally considered one and the same, the AKC formally recognized two separate breeds of cockers—the American Cocker Spaniel and the English Cocker Spaniel—in 1946. The English Cocker Spaniel is a delightfully affectionate dog with a constantly-wagging tail. Their merry temperament and easy-going nature makes this people-oriented breed a fantastic choice for active individuals or families who enjoy spending lots of time with their dog. Without the attention the English Cocker craves, the breed may become destructive. Socialization is important to prevent shyness or extreme submissiveness in the breed. Cocker Rage Syndrome or Sudden Onset Aggression is a very rare condition that can occur in any dog breed, but has been most frequently documented in Cocker Spaniels and show-bred English Springer Spaniels. It is defined by a sudden act of extreme aggression towards someone nearby. A few minutes after the incident, the dog will behave as though nothing has happened and appear not to remember. There is not an abundance of research into the condition, but it is thought to be an epileptic-type disorder or a genetic disorder resulting in low serotonin in the brain. Are English Cocker Spaniels Good with Kids? Properly-bred English Cocker Spaniels are gentle and playful and often do well with children. That said, some Cocker lines can present aggression or behavioral problems. Ensure you are working with a reputable breeder and that their lines are free from aggressive dogs, and socialize your English Cocker from puppyhood. Children should always be supervised while playing with any dog. Any behavioral concerns should be addressed with a trainer immediately. Are English Cockers Spaniels Good with Other Pets? English Cocker Spaniels do well with other dogs and can live with cats if introduced properly. They do have a high prey drive and may chase cats or small animals, so proper introductions and supervision are important. While English Cocker Spaniels are protective of their home and may bark at noises and newcomers, they are quite gentle and are not a suitable choice as a guard dog. The high energy English Cocker Spaniel is an energetic breed that requires plenty of exercise and play each day to prevent destructive behaviors. Prone to nervousness and submissive urination. Can be slow to housetrain. Socialization and continued training are important for a well-adjusted dog. Some lines are prone to aggression or behavioral concerns; working with a credible breeder can reduce these concerns. Indoor Though English Cocker Spaniels are small, they need plenty of exercise and activity outdoors each day. With enough exercise ECS make good companions in apartments or smaller homes. Early training to reduce barking will help keep the peace with neighbors. Outdoor While English Cockers enjoy adventures outside, they dislike being left alone. The breed is not suited to living outdoors. Exercise English Cocker Spaniels require plenty of exercise to prevent destructive behaviors due to boredom and weight gain. Long walks, agility, and outdoor play can burn energy and keep an ECS happy and healthy. Endurance English Cocker Spaniels have plenty of stamina as they were bred as sporting dogs for the field. Running Miles: An English Cocker Spaniel in good health may be able to run two to three miles. Hiking Miles: English Cocker Spaniels may have the stamina to hike up to five miles. Food English Cocker Spaniels require 1½ to 2½ cups of quality dry dog food each day, based on age and activity level. This should be split between two meals. While there is no evidence to suggest that resource guarding behaviors are more prominent in any specific breed, animal behaviorists note that English Cocker Spaniels commonly need training for food and toy guarding behaviors. Children should never be allowed to touch or remove food while any dog is eating. Alone Time Affectionate, people-oriented English Cocker Spaniels prefer to have their people nearby as often as possible. ECS are prone to separation anxiety and can become destructive if left alone for long periods of time. Even an hour or two may be too long for this breed to stay home alone. Crate training may help prevent injuries to a Cocker or damage to your belongings, but may not prevent separation anxiety. The silky coat of the English Cocker Spaniel requires plenty of brushing at home and trips to the groomers. The coat should be brushed daily, trimmed often, and bathed at least every other week if not weekly. The long, droopy ears of the English Cocker puts them at risk of ear infections. Regular cleaning and is important to prevent infections. Trimming nails regularly will help prevent painful splitting, cracking, or a broken nail. 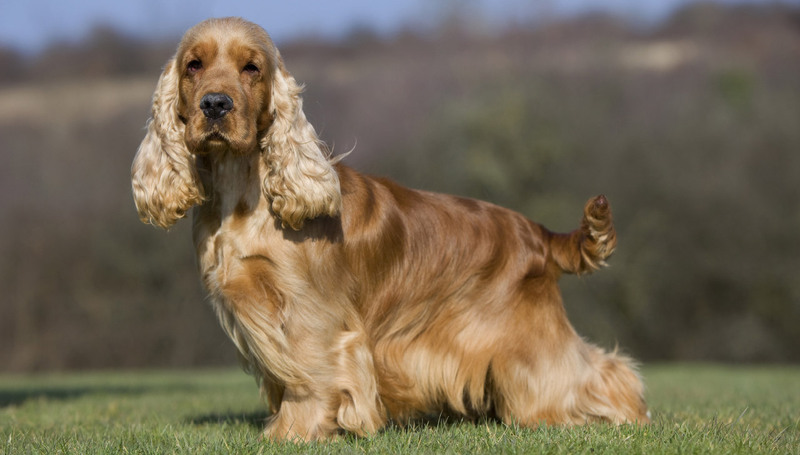 You can minimize serious health concerns in an English Cocker Spaniel by purchasing her from a reputable breeder who engages in responsible breeding practices, and through screening for common diseases and conditions. Positive reinforcement and gentle training methods are the best technique for training the eager-to-please English Cocker Spaniel. They're easily bored with repetition so keep training sessions short and varied. Sternness or harsh techniques will only cause a Cocker to withdraw and shut down. With the appropriate techniques, the intelligent Cocker learns basic commands easily. They may be slow to housebreak, but consistent training, plenty of praise for a job well done, and the use of a crate can make housetraining a success. Advanced tricks and training are easy for the smart, happy-go-lucky English Cocker to learn. They're stars on the agility course and love the time spent learning new things with their people. Bred for hunting, English Cocker Spaniels are versatile sporting dogs. They excel at many aspects of the sporting life—tracking, flushing, retrieving, and more. They're compact and tough, and built to duck through brush or briars easily. What's the difference between an English and American Cocker Spaniel? While similar at first glance, the English and American Cocker Spaniels have differences in both appearance and function. A separate English Cocker Spaniel Club was formed in the 1930s, shortly before the American and English designations were recognized by the AKC. The English Cocker has been bred continually as a sporting dog, while the American Cocker has become more of a family companion. Appearance-wise, the English Cocker Spaniel is larger than the American, and the American has a more rounded head and shorter muzzle than the English. They both have luxurious coats, but the English Cocker's coat is shorter than the American's. Where are English Cocker Spaniels from? Spaniels originated in Spain and may have appeared in England as early as 55 BC. Shakespeare mentioned the spaniel type in A Midsummer Night's Dream. The first Spaniel-type dogs in the United States were said to have come across on the Mayflower. They were bred as hunting dogs as early as the 1400s and the breed type was eventually split into water and land spaniels. The types were further separated in the 1800s to specify Cockers, Springers, and others. Yet another distinction was made when American and English types were recognized in the mid-1900s.